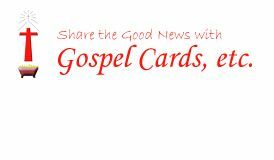 Gospel Cards was started in 1982 when Mike and Sue Hart were unable to find suitable Christmas cards to send to non-Christian family and friends - cards that explained why Christ was born. They therefore produced their own card, and made it available for others to use. That was the birth of Gospel Cards. Since then millions of cards for various occasions have been produced - some designed for sending to non-Christians, others for sending to Christians. In 1997 we started to distribute good Christian books and other literature, and now also produce Christian Calendars for all ages, as well as Framed Picture Texts, Pens and Fridge Magnets bearing Bible verses. In recent years a percentage of sales income has been given to Christian charities. To date this totals over £300,000. We are grateful to God for this ministry in Christian literature, and look to Him to bless many through it.